Any day that supports reading is a very good day! So, like I really believe that NationalRead a Book Day, should be every day… Yet when I was checking the “calendar of days” sites for special days here in September, guess what I found. 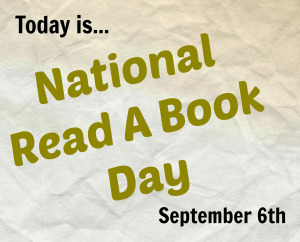 There is actually a National Read a Book Day! Of course, as with many of these “national days” there was no origin information. But do we really need that to celebrate? Uh, methinks not. What a wonderful bit of synchronicity! Indeed anything which encourages reading is truly excellent, there is nothing quite like getting lost in a book. Yes, reading is one of the great joys of life! Let’s shoot for a year! Hmmmm….maybe we will just have to declare it! In case there happens to be someone, somewhere,who needs an excuse to read a book, this is it. No excuses!! Every day should be read a book day! Some people say there is no magic, but then maybe they have never read a book. Great post! Thank you! I absolutely believe there is magic in books.